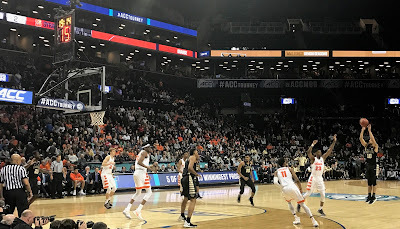 Action between Syracuse and Wake Forest. Photo by Jason Schott. The Syracuse Orange are moving on after their 73-64 win over Wake Forest on Tuesday night at the ACC Tournament at Barclays Center. Syracuse advances to take on North Carolina Wednesday night at 9:30 pm. The day begins with Fiorida State taking on Louisville at noon, followed by Boston College and North Carolina State at 2:30, and then the night session begins at 7:00 with Notre Dame and Virginia Tech. Marek Dolezaj led Syracuse with 20 points on a superb 6-7 from the field, with four rebounds. Tyus Battle had 18 points on 5-9 from the field, including 2-5 on three-pointers, with six rebounds and three assists. Paschal Chukwu had 14 points on 6-7 shooting and nearly reached a double-double as he had nine rebounds. Oshae Brissett had 10 points and nine rebounds. Syracuse came out firing, as they led 9-2 in the first few minutes. That lead built up to 20-4 on a Chukwu layup at the 11:44 mark of the first half. Wake Forest tightened up their defense and eventually they made a game of it, pulling to within 26-22 on a Mitchell Wilbekin three-pointer at the 4:25 mark. Syracuse took a 30-24 edge into halftime. In the second half, Syracuse pushed it back to a 12-point lead, 41-29, on a Battle three at the 16:48 mark. That lead would get up to 19, at 56-37, on a Chukwu layup with 8:12 remaining. Wake Forest put a scare into Syracuse at the end, as a Brandon Childress three-point play cut it to six, 62-56, with 1:58 left. Syracuse took care of business at the free throw line, and a Dolezaj dunk made it a 10-point game, 72-62, with 31 seconds left. Syracuse Head Coach Jim Boeheim said of the win, "At the start of the game in the zone (indiscernible) in the first half we had a lot of good looks and just couldn't make anything. I think the second half we attacked the zone better. I thought Frank did a great job, Marek was tremendous getting into the open spots. He has been looking to score better over the last part of the year. "But I thought our defense really was the difference. They're a very, very good offensive team, and I thought we got them off their spot. They made 14 threes in Syracuse the last time we played, and I thought we did a much better job guarding them on the three-point line. It was a really good win. I think Wake Forest is a really good offensive basketball team." Boeheim said of Dolezaj getting the ball at half court with a minute and a half left with Syracuse up six points, and attacking the rim against Wake Forest's press, "You know, you get in that two-on-one situation, I think you've got to attack it. We had taken the clock down pretty well. You know, with that lead, and you hold the ball and you don't turn it over, it's going to get closer, but you're going to win the game. If he hadn't gone to the basket, they would have had to probably foul. So we had enough margin in that situation. "We tried to use the clock, but we still wanted to be able to score, and we've been very good at that this year when we've had the beat. We've been able to get by people and make plays, either the lob to Paschal or finish the play. But you want to shorten the game as much as you can when you have that kind of lead. I thought they did a good job in their pressure, but we had just -- we had enough cushion." Howard said of how he's seen Dolezaj improving aggressively as he tries to get more baskets around the rim, "He's a talented kid, so we just want to put him in spots where he can be productive. They gave him some open shots in the middle of the night, and he was being aggressive and made a lot of plays. On the fast break, he has a high enough IQ to make the right plays, so we trust him and just got to put him in the right spots. Battle said of Dolezaj, "Well, I think Coach Red has done a great job improving his game as the season has gone on. He's developed a jump shot. He's always made pretty good decisions in the middle. He's just been more aggressive in making the right play as the season went on." In the afternoon, Boston College beat Georgia Tech 87-77, while Notre Dame fought off a spirited Pittsburgh attack, 67-64.